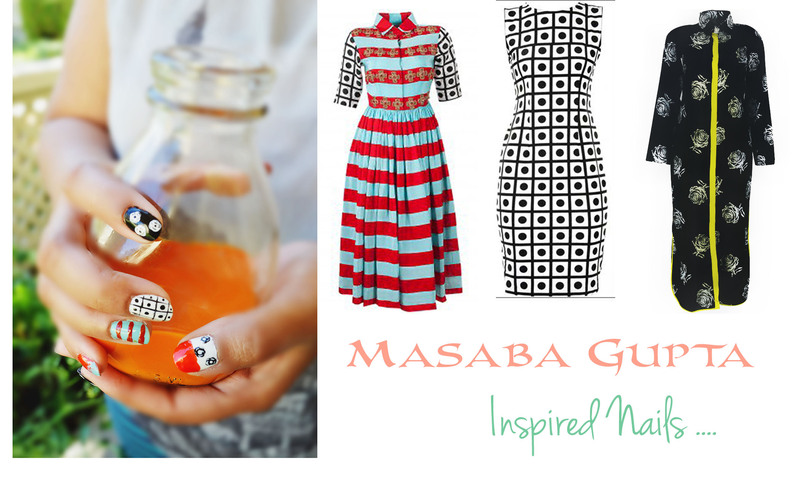 I have a major crush on fun prints and Masaba Gupta is clearly my most favorite designer for her youthful prints. Though we are moving on with her new collection, I am finding ways to revisit my old favorites. While exploring ideas with my sister who has steady hands and every shade of nail polish in million different hues. We were thrilled to find out how surprisingly easy it was to replicate these fun prints using nail polish. So we thought we’d share some of our tips to how to do it yourself. Step 1: Base coat, your favorite shade of White, Black, Red and Teal Nail polish, Top Coat to seal. Step 3: Start with Clean nails to work with (Cut & File) and apply base coat. Step 4: Once ready apply two thin coats of your base colors.Let them dry. Step 5: Start drawing thin lines using black color on your middle finger and form checks.Let it dry. Step6: Draw thick Horizontal stripes with red on your ring finger using the same(or different) brush. Let it dry. Step7: Using the dotting tool or bobby pin dot inside the checks with black on your middle finger. 9: Place smaller dots with opposite color on the existing dots on your thumb and index finger. Clean the mess around your nails(if any) using a q-tip and nail remover.Seal with top coat. Remember if you fail, practice makes it perfect. Try again! Do share your pictures with me if you tried this either in the comment section or on Facebook, twitter or Instagram.